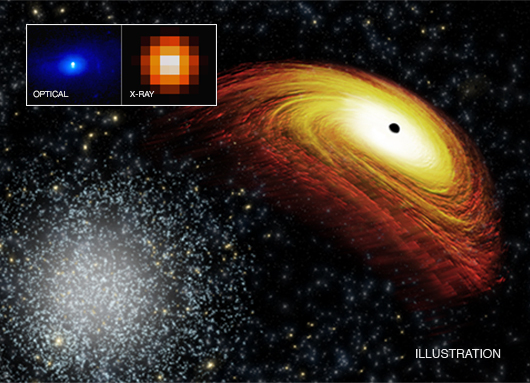 Supermassive black holes are typically stationary objects located at the centers of most galaxies. Under some circumstances, these black holes that contain millions or even billions of times the mass of the Sun can be set in motion. After searching through Chandra's X-ray and optical data, astronomers found a new candidate of such a "recoiling" black hole. This recoiling black hole candidate is located in an elliptical galaxy about 3.9 billion light years from Earth. Coordinates (J2000) RA 10h 15m 27.2s | Dec +62° 59' 11.5"
So, this proves light speed is slower then we thought. Possibly a recoiling black hole. X-rays from the Chandra X-ray Observatory and data from other telescopes. The inset images are about 163,000 light years across.